Landscape package contains tools to handle a variety of pruning jobs. Using a pole adapter, the pruner snaps into the hollow core fiberglass poles for a secure connection. Ferrules allow any combination of poles with the pruner to achieve different lengths, depending on the job. JA-14 1.25 in. Fixed Pulley Pruner. Tbook.com crawls the web to find the best prices and availability on Tree Pruners and related Tools and Hardware products like Jameson Landscaper Pruning Package with Three 6 ft. Poles. For this page, related items include products we find that match the following keywords: "Tree Pruner" at our vendor partner Home Depot. 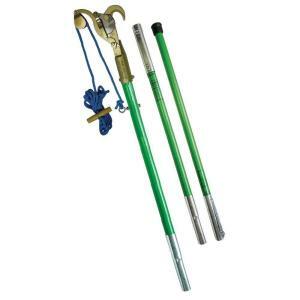 Jameson Landscaper Pruning Package with Three 6 ft. Poles is one of 75 Tree Pruners and related products listed in the Tools and Hardware section of Tbook.com If you have any questions on this product, please give us a call at 734-971-1210 during the hours of 9am - 5pm EST for assistance. Thank you for shopping at Tbook.com, the Internet Department Store!